Can the GOP Deal With Iran? Ten weeks before the first U.S.-Soviet summit ever held in Moscow, in May 1972, North Vietnam, with Soviet-supplied armor and artillery, crossed the DMZ in an all-out offensive to overrun the South. President Nixon responded with air and naval strikes on the North. Yet Nixon went to Moscow and signed the first strategic arms agreement of the Cold War. He did not let Soviet-backed aggression against an ally prevent him from signing a SALT agreement he believed was in the vital interests of the United States. Three months earlier, Nixon had gone to Peking to toast Mao Zedong, whose regime was also aiding Hanoi, and which, two decades before, had been killing GIs in the thousands in Korea. The state is a cold monster, said Gen. De Gaulle. Which brings us to Iran. Should we accept a deal, with a regime as abhorrent as the Ayatollah’s, that would deny that regime a nuclear weapon for 10 to 15 years? For many of the moral arguments against such a deal also applied to the Soviet Union and Mao’s China in the Nixon-Kissinger era. What are Iran’s crimes against America? Tehran held 52 U.S. hostages for the last 444 days of the Carter presidency. Iran’s allies in Lebanon were behind the bombing of the Marine barracks in Beirut where 241 Americans perished. Iran is said to have been behind the terror attack on Khobar Towers in Riyadh in 1996 that killed 19 Americans. Iran provided IEDs to Shiite militias who killed hundreds of Americans in the Iraq war and wounded and maimed many more. From their side, Iranians say the CIA overthrew a democratic government in Tehran in 1953, and imposed upon them the dictatorship of the Shah for a quarter century. Moreover, the U.S., in the Iran-Iraq war in the Reagan era, helped Iraq’s army target Iranian forces, not only with conventional weapons but poison gas. There is good cause for bad blood between us. Yet, compared to Mao’s nuclear-armed China in the madness of the Cultural Revolution in 1972, and Leonid Brezhnev’s USSR, Iran, as a strategic threat to the United States, is not even a 97-pound weakling. The U.S. economy is 40 times as large as Iran’s, and we spend 40 times as much on defense. We have thousands of nuclear weapons. Iran has yet to produce an ounce of weapons-grade uranium. Downing Iran’s air force and sinking her surface ships and submarines would be a few weeks’ work for the U.S. Navy and Air Force. This is not to suggest a war with Iran would be a cakewalk. We could expect Iran’s fleets of fast missile boats to wreak havoc in the Gulf, closing it down to oil tankers, and terrorist attacks on U.S. personnel in Baghdad’s Green Zone, Beirut and perhaps on U.S. soil. In an all-out U.S.-Iran war, Iran could break apart, with ethnic minorities like Kurds, Azeris and Baluch seeking to get out from under Persian rule, as Libya, Syria, Iraq, Yemen and Afghanistan have all broken down to some degree along tribal and sectarian lines. That would deepen the disaster for us and the Middle East. On the other side of the balance sheet, are there major interests that the U.S. and Iran share, places where we can find common ground? Surely, the first is the avoidance of war, which would further destabilize the Mideast, be a disaster for the world economy, and leave Iran a disintegrating wreck. 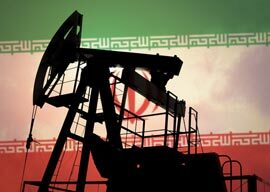 Another common interest is in a secure and open Persian Gulf, where oil can flow freely to the West.